... wish everyone a Merry Day! I'm still cute, and just as merry! ho ho ho! ur so cute & still as cute! merry n blessed christmas to u & ur family! We're having SO much fun today we're just about to crash out for a snooze on the sofa! We started our day early (like every day - he he! ), 7.00 am we met our pals at the park for a walk and the humans popped open a few bottles of bucks fizz to swig whilst TWELVE of us doggies romped around playing and chasing and having a GREAT time. We got home around 8.30 and opened some pressies, then played with our new toys. We had a few snacks around 11.00 and now we're ready for a little sleep - yawn!! 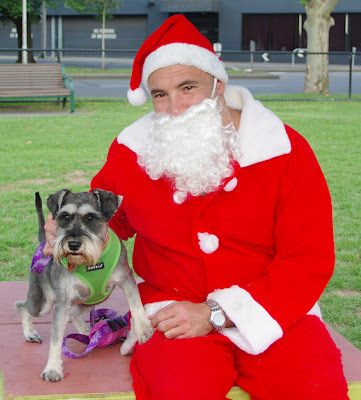 We're so impressed you got to meet Santa Paws - wow! You looked so cute as a puppy and you are simply stunning now - sigh....!! Oh - we got your card yesterday, it's fabulous, we love it and we're going to keep it FOREVER!! Christmassy schnauzer snuggles - JD and Max. Merry Christmas and Happy New Year, Sasha! Sorry I'm so late with visiting but my humans have just been so busy lately with the packing and moving and settling-in thing that they haven't had time to help me do blog stuff at all!